Rock Legend Roy Orbison was honored posthumously with the 2,400th star on the Hollywood Walk of Fame. 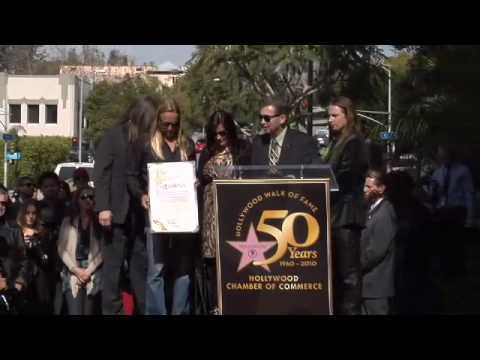 Mrs. Barbara Orbison accepted the star on his behalf. Leron Gubler, President and CEO of the Hollywood Chamber of Commerce, presided over the ceremony. Guests included Dan Aykroyd, T-Bone Burnett, Michelle Branch, Jeff Beck, Chris Isaak, Jeff Lynne, Jason Mraz, Joe Walsh, and Dwight Yoakum. 1750 N. Vine Street on January 29, 2010. Roy Orbison was one of the very first international rock and roll stars, and was a household name by the time he was 21. Loved the world over for a soaring 5 octave voice, and his pioneering way of writing rock and roll songs, Orbison was an artist without limits. Orbison is one of the very few artists to have been accepted by the world in all forms of popular music, and to have won Grammys in pop, rock and roll and country categories. Roy's career tells the story of rock and roll, having pioneered rock-a-billy, rock and roll and pop. Roy's music not only crossed all barriers, it broke them down. He brought rock and roll to Nashville, and these sounds were captured on vinyl and taken to England where they in turn inspired the British Invasion. Then, as the British bands took hold of the charts, Roy was the only single male artist to withstand it, ranking alongside the Beatles and the Stones, all artists who had opened for him as he toured internationally and all artists who remained friends. Throughout Roy's career he would again and again Top the charts, and continue to inspire the new artists alongside the charts with him. The last decade of his life was no exception: The 80's saw Roy Inducted into the Rock and Roll Hall of Fame by Bruce Springsteen, who subsequently joined an all star ensemble for Roy and friends 's Black & White Night (featuring Jackson Browne, T Bone Burnett, Elvis Costello, k.d. lang, Bonnie Raitt, JD Souther, Tom Waits, Jennifer Warnes). On December 6, 1988 the world lost Roy Orbison, but the legacy of his music lives on. Roy was the only artist (other than Elvis) to have two simultaneous posthumously-charting Top 5 albums with his mega-hit "You Got It" (written with Jeff Lynne and Tom Petty) off of Roy's solo release Mystery Girl (a collaboration with Bono); and The Traveling Wilburys (including bandmates Bob Dylan, George Harrison, Jeff Lynne and Tom Petty). Both of these releases also won him two Grammys. In 1991, two years after his death, he won the Grammy for Best Make Vocalist, for his performance of Pretty Woman from the concert Black and White Nights. This totally unique artist enjoyed an unrivaled career that 22 years since his passing, is still flourishing. "And now the journey continues," said Barbara Orbison "with Roy Orbison's star on the Hollywood Walk of Fame." There will never be another Roy Orbison.